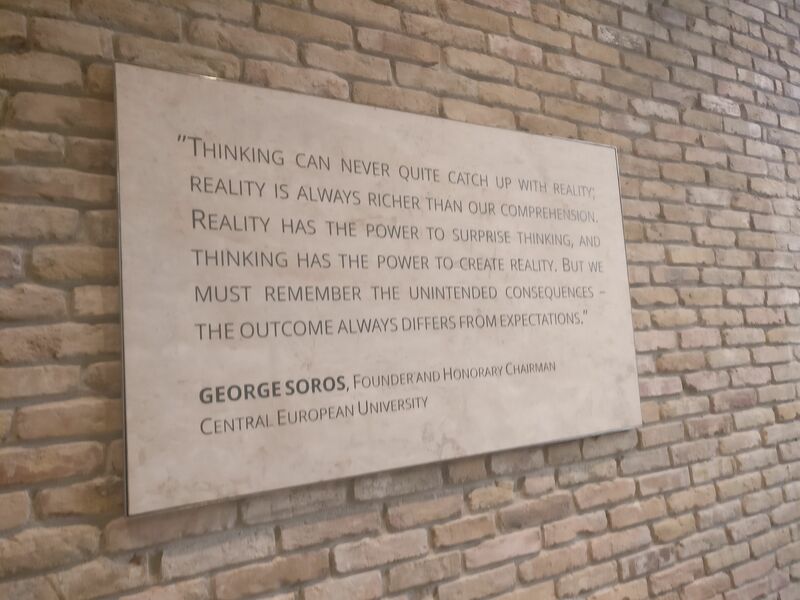 Orban's war against critical thinking. Or why I stand with CEU. Viktor Orbán is on a mission of purging his country of diversity, dissent, and critical thinking, to the point where there is protest without real hope of improvement. A visiting scholar's perspective on Hungarian politics from the safety of an institute of higher education: populism and xenophobia versus the comfort of critical academia. I’m standing in a crowded street in the middle of the gorgeous historical center of Budapest. It’s chilly and I have to stand on my toes in order to see anything. I am surrounded by a sea of students, ex-students, employees, and sympathizers of the Central European University (CEU). On the stage there is a Venezuelan CEU alumnus—noticeably angry, heavily gesticulating, he is giving a heart-felt speech about critical thinking. Luckily for me and my co-fellow, this particular speech is in English: for most of the evening we have been cheering sportively and supportively without having any idea of what’s being said. But that’s not the point. We are here symbolically. We are wearing buttons with the text “I stand with CEU”. People are shouting and blowing on whistles. The left-wing party Momentum Movement, who has staged this event, are collecting donations—supposedly for throwing the next demonstration. This has been the fourth since I arrived here, and I’m sure many more will follow. To be honest, I’m not so sure whether they will have any effect. I arrived in Budapest the first of October for a research stay of nine months on a fellowship from the Institute for Advanced Study (IAS). This institute brings together scholars from the social sciences, humanities, and law, from all over the world. Its mission is to promote “the free, independent pursuit of scholarly research in the context of an interdisciplinary intellectual community. 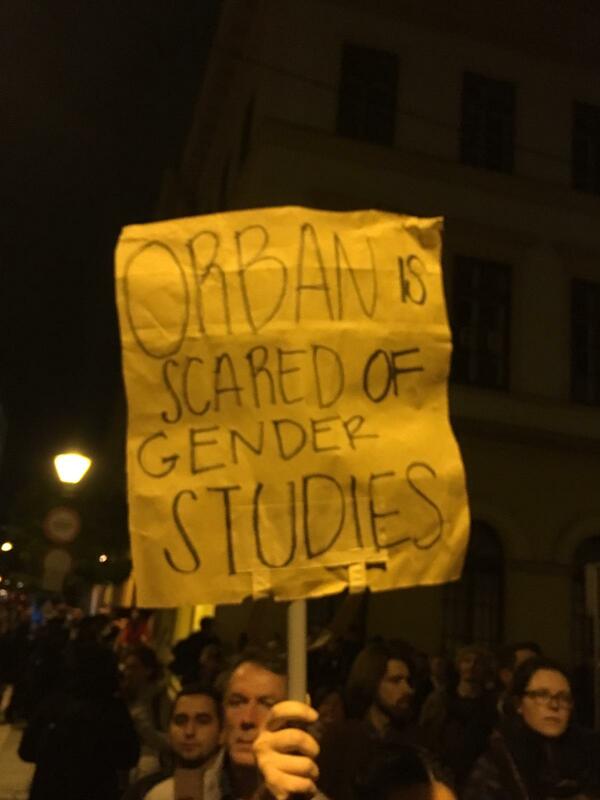 IAS is affiliated with CEU, the university founded by George Soros which Viktor Orbán and the current government have been actively trying to expel from Hungary. In 2017, Orbán started his anti-Soros campaign, with propaganda posters saying that the 87-year-old philanthropist has an evil plan of letting immigrants take over the city. Last spring, the Parliament stated a new law which held that any Hungarian university which was incorporated abroad had to have a campus in its home country in order to be allowed to remain operative in Hungary. This seems to be exclusively intended at CEU which, with its New York branch Bard College, is the only institute to fit this description. After months of protests and negotiations, President Rector Michael Ignatieff succeeded in officially allying his university with Bard College in order to safeguard its continued Hungarian operations. Having been signed by all the officials, this plan is still awaiting the approval and signature of Orbán and the Parliament. I have been invited as part of this year’s IAS cohort of 24 lucky fellows in total. From the very first moment, director Nadia Al-Bagdadi, academic secretary Éva Gönczi, the amazing support staff, and the people who work at the guesthouse that accommodates us, have gone out of their way to create the ideal environment for writing, thinking, and doing research. They offer plenty opportunities to share our ideas and go into discussion, for instance in weekly fellows seminars and lunches where we all take turns presenting our work. They hook us up with CEU scholars whose research is of interest to us, to forge collaborations within and across disciplines. But even more importantly, as Éva said to me the first day, “our job is to leave you alone.” Everything is put into work to grant us the opportunity to make the most of our fellowship period. And they do this just for the sake of high-level scholarship. The warm welcome we received made me feel like I’d died and gone to academics’ heaven. Especially since such a grand gesture of hospitality, of inviting strangers into your country, city, and institute, and letting them share in all the resources you have to offer, is the exact reversal of what is going on outside the walls of the beautiful white nineteenth-century building where our offices are located. Free scholarschip in the land of Orban? Orbán’s party Fidesz won the 2010 elections with a two-thirds majority of the votes, overthrowing the Socialist Party that had been in power since 2002. Fidesz was founded in 1991 as part of a new wave of post-Communist, leftist parties. They were in power from 1998-2002 and since then made an ideological turn to the right. In 2010, Fidesz took a number of measures to fasten its grip on the country: they changed the constitution, enacted new electoral rules, severely limited the possibilities for independent TV and radio, and started to systematically take over provincial newspapers. Now, there are no independent newspapers left in any city besides Budapest, and even here they are disappearing. After winning again in 2014, Orbán went further in his authoritarianism, which he terms “illiberal democracy.” Since then, aided by the transnational European trend of anti-immigrant sentiment, Fidesz is becoming increasingly more hostile towards the EU’s immigration policies. There is something alienating about this contrast between the institute and the gritty political climate which at times makes me feel guilty. During his welcome speech, which we were enjoying in one of CEU’s many beautiful historic rooms, a glass of champagne in hand, the Provost advised us that ‘the ivory tower’ is not a bad place to be about this time. They jokingly advised us to not read any newspapers, to leave our windows and doors locked, to immersive ourselves in our own research. They almost made it seem like a form of resistance. Our first outing was to the countryside, wine-tasting and visiting a Beethoven museum. This allowed us to shut out the political turmoil for at least a while. Monks at the edge of a battlefield? Later, we met Ignatieff who gave the opening speech to our Science Slam at the same day it was announced that his university would have to emigrate to Vienna. He called us “monks at the edge of a battlefield.” It sounds almost perverted, but maybe reserving some time and space for independent thinking is becoming a form of rebellion. It is certainly under threat here. And of course, the continued deferral of giving CEU the green light to start accepting students for the academic year 2019-’20 has now forced the CEU’s board of Trustees to make the decision to leave Hungary. This would mean Orbán and his party have succeeded in chasing away the first institute of higher education, and it is not likely to end there. The end of democracy in Hungary? Before my arrival I was expecting more of a combative atmosphere. To my surprise, many of the Hungarian colleagues I speak seem to have to some extent made peace with the outcome. An acquaintance at the University of Szeged confesses that she has told herself she must leave the country once the expulsion of CEU would be finalized. Several colleagues are telling me they refuse to raise their children in the country that Hungary is becoming now. Again I feel guilty and powerless: I am just a visitor. At the same time, we should all be extremely concerned about this. Due to severe and ongoing cuts of funds for higher education, the other universities in Hungary are now facing an uncertain future. Susan Suleiman calls this “a real loss for Hungary and one more sign of the erosion of democracy in the country.” Hungary runs the risk of becoming a country without dissent and without diversity, robbed of cultural variety and educated people, barred from access to world news or non-Hungarian language culture. All movies dubbed, everyone thinking the same thoughts. Orbán’s actions against freedom of thought and press are bound to inspire other right-wing dictators. He is supported by Putin. He is well-connected with the Alt-right in the US who share his hatred for Soros, and good friends with the Trump administration. Trump’s former chief strategist Stephen K. Bannon has even called him a hero. Orban, is one manifestation of an emerging global new right network. Even if all that is left us in this case really is symbolic action, if you care at all about the freedom to think for ourselves, sign the petition here. Inge van de Ven works as an assistant professor of Online Culture at Tilburg University.